They are characterized by especially soft, oil-free strokes. All colors can be mixed together, smudged or dissolved with water. A fixative spray coat is recommended when hard pastels are applied to most paper surfaces. The complete range of 72 colors includes Cretacolor's brown and gray chalks in 12 shades — browns, cool and warm grays, white, and black. These expressive art materials have traditionally been appreciated for the variety of shades they can create in working with the other colors. Mixing hard pastels, or smudging or combining them with brown and gray chalks, can create special color effects. Experiment with water and different paper surfaces. Hard pastels are much less dusty than soft pastels. Square pastels are especially easy to handle and store. Individual sticks measure 2¾" long by ¼" square(70 mm × 6 mm). Metal box sets, packaged in light but sturdy tins, are great for travel. 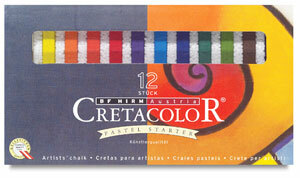 Cretacolor has an impressive line of watersoluble products including briques, pencils, crayons and pastels. All of these products perform wonderfully as drawing tools — but become fluid and even more brilliant when you add water. This video defines the various attributes of Cretacolor's Aqua Briques, Aqua Stics, Aqua Monolith Pencils, Marino Watercolor Pencils and Carré Pastels.